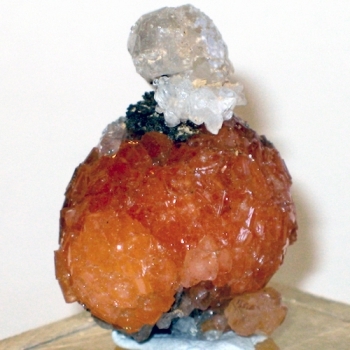 / Olmiite Sphere with Calcite Gem--New Lower Price!! Dimensions (HxWxD): 1.25" x 1" x 0.65"
This glittering druzy orange-peach colored Olmiite Double Globe has a lovely little calcite and matrix foundation upon which it sits & glows. It is a small enough piece to hold in the hand for use during meditation, healing or energy work. It is large enough in spite of its small size, to stand out quite nicely on an altar or bedside table. Try the Olmiite if you want original Mother Earth energy. This stone is the most Cthonic variation of the nurturing Great Mother energy stream I've ever experienced. Be careful what you wish for in a healing session with this crystal, because you may be surprised at the many levels of healing which are addressed & the speed & thoroughness, with which your requests may be answered. I must confess that I was very attracted to this stone the moment I saw it! I am finding that many of the new stones which are coming out of the ground in the last couple of years are the darker varieties, including dark & light smoky quartz varieties, orange & red spessartine garnets & now the lovely Olmiite. The fact that so many of the darker stones are coming out of the mines these last couple of years, is synchronous with an energy signature I feel is so important to tune into for Lightworkers, healers & anyone who works with crystals at this time in history. This healing energy signature would also be helpful for anyone who wants to accelerate personal & planetary healing. More & more important, for more & more of us, is the need to make sacred our personal connection with our dear planet, Mother Earth. Olmiite, formerly known by another variant, Poldervaarite, from South Africa, is a new find from the end of 2008, only out in front of the global public from the Tucson show in Arizona just held in January/February '09. It is from the Kuruman District, Northern Cape Province in South Africa from the N'Chwaning II Mine. Poldarvaarite is an orthohombic silicate, and Olmiite has more manganese in the mix, imparting a peachy orange-pink coloration. 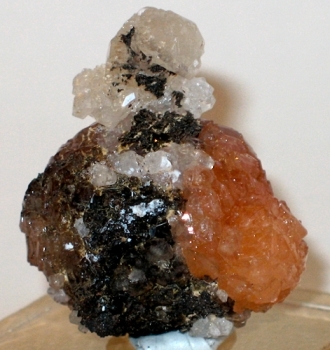 Poldervaarite & Olmiite occur in colors ranging from white to brown, pink, salmon & golden & orange. With a hardness of 5, it has a vitreous lustre and forms either druzy globule shapes or sheaves of wheat formations, often still appearing on matrix stone. Very little work has been done to define the metaphysical or healing properties of Olmiite but some initial observations can be made. 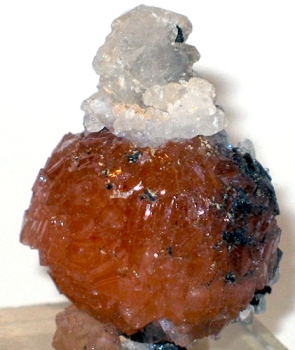 In the Western chakra system, peach colored Olmiite would be associated with the second and third chakras, and would nourish the flow of prana or chi throughout the physical and energy bodies. Each one of us needs to connect with a little corner, tree, garden plot, deva or healing crystal in order to strengthen our commitment to healing our planet, ourselves, our families & our communities. Crystals & the crystal kingdom of devas want to assist us in this rewarding work! When I first tried this lovely stone in a meditation I asked for a lot of healing. And I got it! Only next time, I think I'll focus in a bit better so that I'm more able to clear the 'stuff' brought up into the light as it appears. As it happened, I guess I wasn't expecting anything and so much clearing took place in a short period of time, that I was a bit overwhelmed. This druzy ball with it's soft & glittering orange-peach surface will work on your mental, emotional, physical & spiritual bodies offering healing at whatever levels are needed. I felt that it could address needs on a cellular level, if I knew what that 'looked like'. Again, be careful with this deep healer, for she will answer your heart's request in a very strong way! Olmiite is a relatively soft (5.5 on Mohs scale) vitreous silicate mineral with a preponderance of manganese and some calcium, which appears in a color range from beige to peach to pink to orange in nature and looks bright strawberry red under a fluorescent light. Calcite is named from the Greek chalix meaning Lime and has the chemistry: CaCO3 Calcium Carbonate. It belongs to the mineral class Carbonates, Calcite group. Calcite is one of the most common minerals on earth and is approximately 4% by weight of the Earth's crust. It forms in a variety of geological environments and in all three of the major rock classification types: Sedimentary as oolitic, fossiliferous and massive limestones, Metamorphic changing from Limestone to Marble through heat and pressure and Igneous as Carbonatite. In some cases, Calcite may be as much as 99% of the component minerals! What is extraordinary about Calcite is its amazing diversity of habit, and colour that may be white, colourless, yellow, orange, blue, pink, red, brown, green, black or grey. Calcite is the main mineral component in the cave formations of stalactites and stalagmites and other variants. Water, rich in Calcite goes into a dry cavern and begins the slow process of evaporation, which precipitates the Calcite. In general, Calcite speeds up spiritual development. It brings emotional stability, consistency and self-trust. It increases the ability to overcome challenges. It encourages the transformation of ideas into action by amplifying energy, mastery and success. Calcite stimulates the metabolism and benefits the immune system and the heart. It enhances growth in children. It alleviates skin and intestinal conditions and encourages healing of tissue and bone. Use this lovely specimen to reconnect with Mother Earth to offer healing to yourself, your family, community or clients & patients. Use this piece with the blessings of the angels & devic kingdoms & watch the changes happen in your life! We trust you will use this powerful crystal with loving wisdom and respect its long journey in the Earth that has lasted for many long historical cycles, a delightful gift from our dear Mother Earth. Check out the article "Using Quartz Crystals in Digital Technology, Healing and Meditation for an overview of the metaphysical and mineralogical properties of quartz, and a step-by-step guide explaining how to cleanse, charge, and program quartz crystals for healing, meditation and other spiritual purposes. Actual Weight is 16.7 grams. Measurements are 3 cm x 2.75 cm x 2 cm.